It’s funny how political rhetoric shifts over time, isn’t it? I really like Madison in the spring. Summer is also decent – clear skys, and I can usually deal with the heat while running, so that’s not a big deal. Autumn is gorgeous in the upper midwest. But winter is tough, especially if you’re like me and cold all the time. So I decided to start taking some photos of Madison to remind me why I live here (besides being engaged to a guy who lives here, I mean). Also, it gives me a chance to practice my photography. 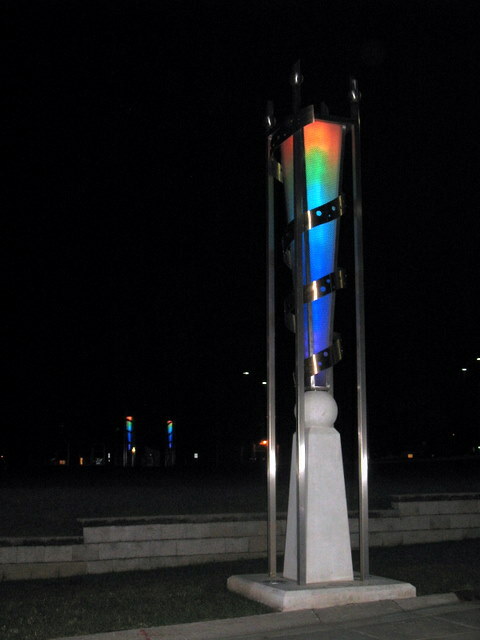 A statue in front of the Kohl Center, by evening. I took this one Wednesday night on my way back from lecture. Taking photos at night is difficult because my hands shake, but it came out well after I messed with the settings a bit. After reading close to 600 pages of stuff about libraries in the past three weeks, I’ve gotten a little tired of spending my every waking moment thinking about literacy, archives, and the information society. Fortunately, my future in laws brought us approximately 10 lbs of apples the other day (my fiance B. has given away at least 30 apples and not made a dent in them), so to help clear us of this mess I made a pie. This recipe was made partially out of this one from my brother and his fiancee’s blog, and partly out of this one from All Recipes.com. 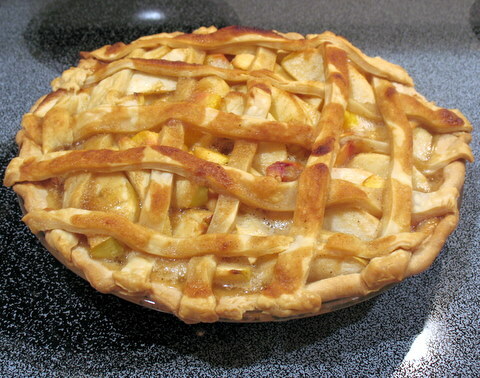 Because there is a limit to how much time I have to spend on this, I used a pre-made pie crust. It came in a box at the grocery store and made this basically the easiest thing ever. Futz with the pie crust. Don’t pre-bake – you’ll want a bottom crust with enough dough left over to do a lattice on top. Peel, core, and slice the apples and nectarine. Mix in a bowl and squeeze orange juice over them. Heap in the bottom of the pie crust and put the lattice over it. Melt the butter in the pan. Add the brown sugar, water, and flour. Add the spices (in an amount which might be described as “some”, probably about 1 tsp of each, but I wasn’t really measuring. Pour the sugar mixture over the pie. Bake for 15 minutes. Turn oven down to 350 and bake for another 30 minutes. A: Delicious. It looked a little soupy, and I think I would cut the amount of liquid (butter+water) and maybe even add some corn starch, but it tasted phenominal. B agreed. Edited to add: it wasn’t soupy at all the next day. You can stop at red lights, but then keep running again when they turn green. I ran 20 miles this morning. There’s something weighty about the distance itself, quite apart from the pain it inflicts. Twenty is such a large, round number, a distance often driven and rarely traveled afoot. In America, where people rarely put shoe leather to paving stones, I doubt most people understand how far 20 miles actually is. I wonder if three hundred years ago most people would have known someone who lived farther than, say, 50 miles away. And yet it’s a requirement of modern society that we be able to travel and communicate across these distances at great speeds on a daily basis. C: The week I injured my ankle and had to take several days off (this follows a half marathon and my black belt test, so I’d been putting it through the wringer). My marathon training really began after this. 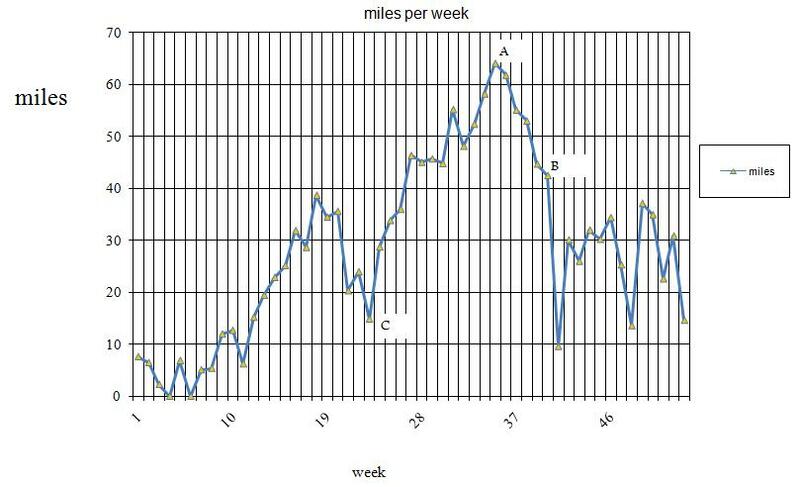 A: My peak of 64.1 miles, reached the week of 31 August. Also the week before I met the guy who’s now my fiancé. Coincidence? B: The week of the marathon. I ran 42.5 miles that week, though a little more than half of that was the marathon itself. This is because I don’t know how to turn it off, even when I’m supposed to be relaxing. My average weekly mileage is a lot higher, although my long runs are generally shorter (I’ve only done one twenty-miler so far, compared with four before the marathon last year). I’m also doing a lot of speed work (it helps that my training partner is working on improving his 10k time), so my runs are getting faster (instead of the 12 minute miles I was running in 08, I’m doing mostly 10s and 11s with a handful of 9.5s thrown in – a marked improvement for me). Although I’ve been running for years, I’ve only really been doing serious distance since Fall 2007 (when I ran my first 10k). It’s really interesting to see how my running has changed over time. 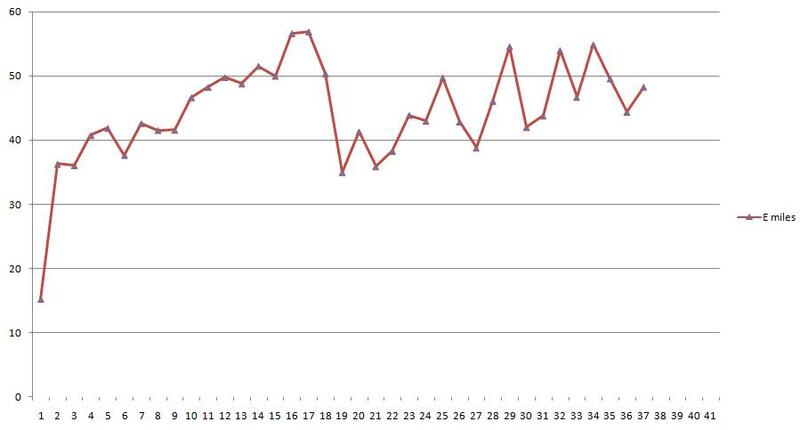 I’ve been routinely hitting close to 50 miles per week for half the year (my standing goal is “at least 36”). I’ve also noticed that while my absolute minimum for a run (that is, the minimum I had to run to feel okay) used to be about 5 miles, now it’s between 6 and 7 miles. Any more and this is going to start cutting into my life a lot…I guess it’s a good thing I’m getting faster. The marathon is 25 October, a little more than a month from now. I think I’m ready. Once upon a time I started through a book on C (possibly C++) that had us write “Goodbye, Cruel World” programs instead of “Hello, World!” programs. I am eventually going to write a few things here. But for now I think I’m going to go do some editing of my poor, neglected novel, so I will have to do that later. Author adminPosted on September 8, 2009 Categories UncategorizedLeave a comment on Goodbye, Cruel World.